Most Chinese-language textbooks today cater to beginners and intermediate-level students, but virtually none address the unique needs of advanced students seeking to expand or reinforce their language skills in one semester. Readings in Contemporary Chinese Cinema fills this gap through the use of critically acclaimed Chinese films to teach students Chinese while also broadening their knowledge about China. The authors have carefully chosen ten movies produced in recent decades by filmmakers from mainland China, Taiwan, and Hong Kong. Set broadly within the twentieth century, these classic films are representative of both urban and rural life, and vividly depict the diversity of perspectives that comprise contemporary Chinese society. The authors provide an informative synopsis and critique of each movie, and include selections of movie dialogue that allow students to practice and build proficiency. The comprehensive lessons are supplemented with exercises, sentence-pattern examples, English-language glossaries, and extensive vocabulary lists. There are also discussion questions that can be used in conjunction with screenings of the films. 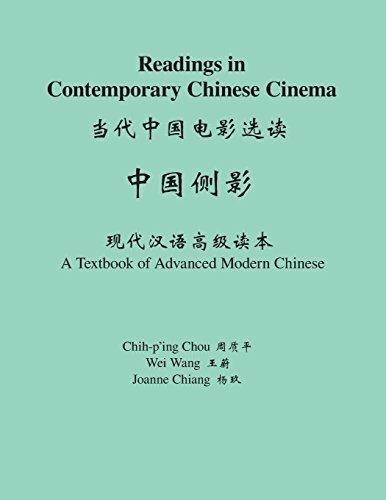 Readings in Contemporary Chinese Cinema is designed for students with three or more years of college-level instruction in modern Chinese, and can be used alone or as a sequel to Anything Goes: An Advanced Reader of Modern Chinese. It has been proven effective at Princeton University and in the Princeton in Beijing program, and is ideal for those returning from study abroad in China. If you have any questions about this product by Brand: Princeton University Press, contact us by completing and submitting the form below. If you are looking for a specif part number, please include it with your message.